Brandon Browner leveled Ladarius Green as the Chargers tight end was bobbling the ball, but was penalized for unnecessary roughness. SAN DIEGO — With two more penalties in Sunday’s 23-14 win against the Chargers, Brandon Browner has now been flagged 11 times in the seven games he’s played for the Patriots. He strongly took issue with the second 15-yard penalty, which wiped out an interception that Devin McCourty returned 56 yards for a touchdown in the third quarter. Browner leveled Ladarius Green as the Chargers tight end was bobbling the ball, but instead was penalized for unnecessary roughness. The league has been cracking down on those big hits, which many defensive players think should still be legal. But they know when a flag has likely been thrown. McCourty said he could sense the penalty even as he was returning the interception, and thus didn’t celebrate when he reached the end zone, assuming the return was about to be nullified. It was. Browner was also flagged 15 yards in the first quarter for a facemask on a 2-yard run by Ryan Mathews. That was his 10th penalty of the season, for a variety of infractions: Browner has now been called for defensive holding, pass interference, offsides, illegal use of hands, illegal contact, facemask, and unnecessary roughness. It wasn’t pretty, but the Patriots overcame a slow start to rally for a 23-14 win over the San Diego Chargers. Even so, Browner said he won’t change his style. Green left the game with a concussion after the hit and did not return. It will be at least one more week before the Patriots get defensive end Chandler Jones back. Despite returning to the practice field Nov. 29 and accompanying the Patriots on their two-city, eight-day business trip, Jones didn’t play against the Packers or the Chargers. A hip injury has forced Jones to miss six straight games; he was hurt in the Oct. 16 home win over the Jets. Jones is arguably the Patriots’ best pass rusher; he has 4½ sacks in the seven games he’s played this season. So the Patriots faced the Chargers without their best edge rusher, and also their best linebacker. Dont’a Hightower, who suffered a shoulder injury in the loss at Green Bay, was limited in practice all week and was originally listed as questionable to play. It was Hightower’s third missed game of the season. Joining Jones and Hightower on the seven-player inactive list were running back James White, cornerback Alfonzo Dennard, linebacker Chris White, and offensive linemen Cameron Fleming and Jordan Devey. Chris White was listed as doubtful after not practicing all week with an ankle injury. Fleming was limited with an ankle injury and has now missed three straight games, and eight of the last nine. Dennard, James White, and Devey were healthy scratches. Designating those seven as inactive meant that defensive tackle Sealver Siliga would be in uniform, one day after being taken off the short-term injured reserve list. Siliga was sent to IR with a designation to return on Sept. 27 after suffering a foot injury in the third game of the season, against the Raiders. He returned to practice in the days leading up to the Packers game, starting his 21-day window to either be promoted to the active roster or remain on IR, ending his season. Siliga played right away, seeing snaps on San Diego’s first offensive drive of the game. Another injured player making his return was long snapper Danny Aiken, who missed the Green Bay game with a concussion. Rob Ninkovich handled the long snapping duties against the Packers but wasn’t spotted on the field working with the specialists before the game, a good sign that Aiken would be able to play. Offensive coordinator Josh McDaniels reiterated last week the Patriots’ preference for balance. Against the Packers, the Patriots called 17 running plays and attempted 35 passes. The week before against the Lions, it was 20 rushes and 53 pass attempts. Through 11 games, the Patriots had 332 rushes and 462 pass attempts. The first time the Patriots had the ball, they ran it nine times and attempted six passes, with all four running backs — LeGarrette Blount, Shane Vereen, Jonas Gray, and Brandon Bolden — seeing the field. Not long after, the Chargers had a 14-3 lead, which prompted the Patriots to use a personnel grouping they hadn’t shown, at least not this season: No running backs, with three receivers and two tight ends. They used that for the first eight plays — all passes — before sending in Vereen once they got inside the red zone. The Patriots finished with 28 rushes and 44 pass attempts in their 24-13 victory. Brandon Bolden, who’s made an impact on special teams all season, made his biggest play by blocking a Mike Scifres punt in the second quarter. Bolden blew by a would-be blocker, and violently met up with Scifres just as he was making contact with the ball. After their first blocked punt since Week 4 of the 2010 season, the Patriots took over at the San Diego 25-yard-line and scored a touchdown four plays later, cutting the lead to 14-13. Scifres was injured on the play — his left arm was wrapped heavily as he was taken off the field on a cart, and it was in a sling after the game. Before he left the field, Bolden came over to the Chargers punter and spoke to him. Forced into action was Chargers placekicker Nick Novak, whose first punt traveled just 27 yards. He got better from there – 33 yards, then 45, then 51. He averaged 40 yards on six kicks. Rob Gronkowski made history again. He became the first tight end in NFL history to have at least 10 touchdown receptions in at least four seasons. By catching a 14-yard touchdown from Tom Brady late in the first half, Gronkowski had his 10th scoring pass of the season. He had 10 as a rookie in 2010, then 17 in 2011, and 11 in 2012. Gronkowski was limited to four touchdown receptions in 2013, when he played in just seven games. 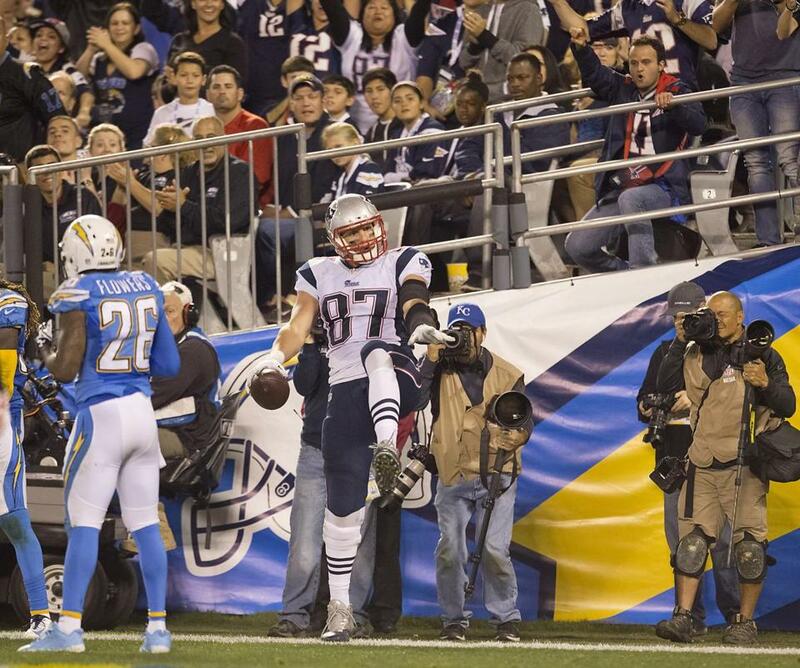 The scoring pass also let Gronkowski break a tie he had held with Jimmy Graham of the New Orleans Saints. Both tight ends had caught 50 touchdown passes from the same quarterback — Brady in Gronkowski’s case, Drew Brees for Graham — which was the second-best QB-tight end touchdown connection in NFL history. The combo with the most scoring plays? They were on the field Sunday night, too. Tight end Antonio Gates has caught 69 touchdown passes from Philip Rivers. He was kept out of the end zone against the Patriots, but had five catches for 34 yards. Patriots tight end Rob Gronkowski caught a 14-yard touchdown pass in the second quarter. 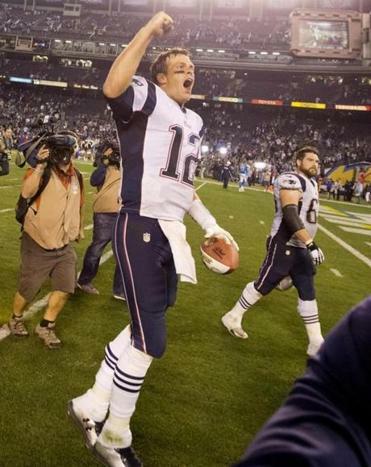 The win gave the Patriots at least 10 wins for the 12th consecutive season. Only two franchises have ever reached that figure; the San Francisco 49ers had 16 straight 10-win seasons from 1983-98 . . . Linebacker Jamie Collins had the first multiple-sack game of his career, with two in the first half. 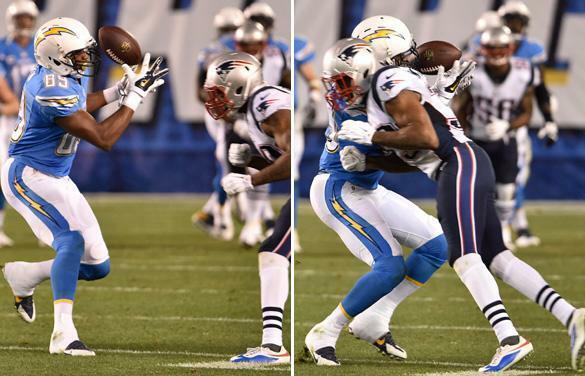 Akeem Ayers had his first interception for the Patriots, picking off Rivers in the third quarter. . . . The Chargers wore their powder blue jersey tops with the white bolt helmets, a throwback look that they’ve been breaking out twice a year for special home games. . . . Former Patriots running back Danny Woodhead was seen catching up with a handful of his old teammates before the game. Woodhead, suffered a season-ending broken fibula in San Diego’s third game.